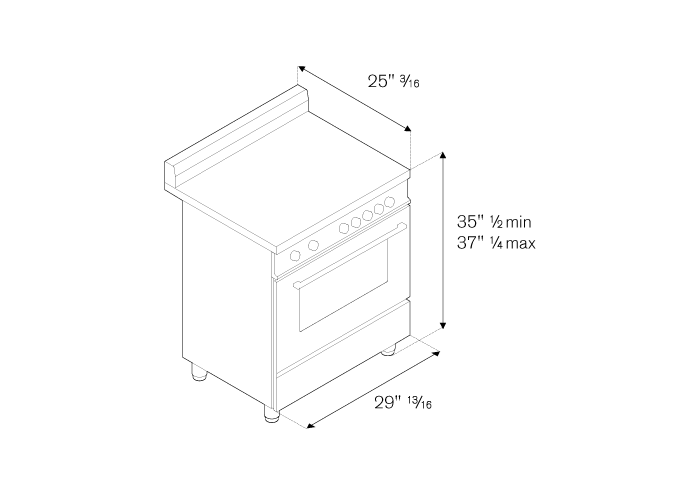 First Oven: 3.4 cu. ft. This versatile size works just as well in a new kitchen design or with existing cabinetry. The beautiful smooth cooktop includes 4 induction heating zones including booster feature, pan detection system and residual heat indicator for each zone. The electric self-cleaning oven has nine functions, from convection, baking and roasting to warming and includes telescopic glide shelves. The pyrolytic oven linings require no cleaning agents. High temperatures burn off fat and grease leaving a safe, easily disposed of residue. Quadruple-glass door minimises heat loss. All Bertazzoni appliances integrate seamlessly with each other and with the kitchen cabinetry and countertops.